ISIS has made public its letter to Congress critiquing the State Department’s September 4th, 2002 report on Plan Colombia, the US sponsored aerial herbicide spraying in Colombia. Authors Jim Oldham and Rachel Massey assert that, in contradiction of a recent State Department finding, this approach to the war on drugs is illegal and threatens both the environment and human health. 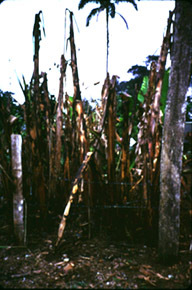 They argue that the State Department report, (available on line at http://www.state.gov/g/inl/rls/rpt/aeicc/), does not meet Congressional requirements for the release of more funds for herbicides. The ISIS letter is one seven independent reviews critiquing the State Department report. The other reviews can be found at http://www.amazonalliance.org/scientific/scientific1.htm and a press release from the Amazon Alliance summing up the reviews is at http://www.amazonalliance.org/scientific/press.pdf. ISIS has recently begun to investigate the impacts of "Plan Colombia," the US program to wage a "war on drugs" via aid to the Colombian military and support for aerial spraying of herbicides in regions where drug crops are produced. ISIS is concerned in part because the threat of increased violence and conflict throughout the region is so clear from where we work in Ecuador. As US-funded spraying programs and counter-insurgency up the ante in southern Colombia, the flow of refugees into Ecuador increases—as does the presence of armed actors and the resulting violence. Currently the ISIS focus is to collect and publicize information about the impacts of Plan Colombia, particularly the aerial herbicide spraying, and to provide scientific documentation of health and environmental effects experienced by impacted communities. We have prepared a factsheet for quick reference as well as a more lengthy review of the spraying campaigns in Colombia. These two articles are also available for download as Acrobat Reader files: factsheet.pdf and review.pdf. We also monitor and analyze information presented by other sources. ISIS Research Fellow Rachel Massey wrote a memo in March 2002 (also in pdf format) critiquing a report, commisioned and distributed by the US Embassy in Bogotá, which purports to show that health impacts from spraying are negligible. In March 2001, ISIS started working locally on Plan Colombia with a seminar series for the Five Colleges and Pioneer Valley which we co-hosted with the citizen group Solidaridad Colombia. Speakers included Colombian human rights workers Regulo Madero and Carlos Palacios, Sanho Tree of IPS, Rachel Massey (ISIS Research Fellow), and local Witness for Peace delegates Kate Harris and Tad Montgomery. Venues ranged from colleges to churches to community centers from Springfield to Greenfield, Massachusetts. 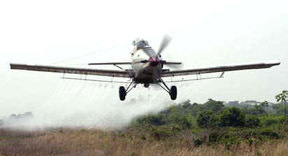 Since then, we have worked through our membership in the Amazon Alliance and with an informal network of NGOs and individuals to identify and publicize concerns about aerial spraying of herbicides. One of the most important products of this collaborative work was an open letter to the US Senate raising these issues and signed by over 150 scientists and health care professionals. 2) "Casualties of the 'War on Drugs:' Traditional farms destroyed with herbicides" by Elsa Nivia and Rachel Massey (GPC, August 1999, Volume 9 No. 2). "Colombia Policy Briefs was created in response to the need for comprehensive information on Colombia and related US policy issues. Given the wide range of viewpoints available on Colombia, this site provides interested parties with a mechanism for collecting information and for analyzing opposing viewpoints." "The Center for International Policy offers a comprehensive source of information and analysis about peaceful efforts to end Colombia's conflict and the United States' increasing military involvement." A clearinghouse for information related to "US Aerial Chemical Eradication [of drug crops] in Colombia and the Third World." Image at the top of this page is borrowed from and (c) usfumigation.org.